Like most darker projects podcasts on itunes are all broken up and not complete u must go to the website to obtain them. Once u get them all and load them to your device they categorize differently so annoying!!! Guys, you should check out We're Alive. It's another zombie survival podcast, but the acting isn't bad, and each person has a different personality, unlike this podcast. I'm wanting to listen but I can't even download the first two episodes. Fix and I'll re-rate the stars. Let me start by saying I'm a zombie fanatic. I love the genre...so when this podcast was recommended by a friend I was stoked to say the least. The story is solid and the podcast audio is good...but it doesn't end! :( How disappointing! I was into the story and the characters and then nothing!!! I really hope the guys at Darker Projects update this some time soon. They're work is really good...I listened to their series Autumn as well (which I'd also highly recommend to the zombie fans out there), but I'm starting to see a tragic trend of really great stories that get started and then just as quickly get abandoned. Please Darker Projects, finish your zombie podcasts! Your fans are waiting for you! Where are episodes 2 and 6? I won't start listening until they are all there, don't want to skip any or listen out of sequence. Too bad, Darker Projects is usually pretty good. Awesome story, awesome acting, awesome everything. Please finish. Really cool series! Kinda' weak voice acting for some characters, but easy to tell them all apart. Production quality seems to improve each episode. The music is John Murphy's stuff from "28 Days Later", which is forgivable since; 1) Is good, intense music and they use it well in the story.. and 2) They don't seem to be making a profit off of this, so copyright shouldn't be an issue. Only major problem is: I want to hear MORE!! The acting is good, the storyline is great, and zombie podibooks are down right amazing. Make more! I want to see the ending. This is one of my favorite for the price you pay this is a labor of love . I recomend this to anyone who loves the old style of story telling which is the only way of doing it right . It's not bad, but it's not great. Voice acting has a tendency to be a little overboard. Story seems good, but nothing gets finished. Here's my biggest complaints. First, like all Darker Projects, it just ends. It's doesn't finish, or come to a completion point, but just suddenly ends. You know there should be more episodes, but nothing. Second, also like all Darker Projects, they don't tell you if it is part of another story. Therefore I listened to Darker Projects Autumn first, only to find out that it was a continuation of this story. Third is the ridiculous amount of time between casts. Which also seems to be usual for Darker Projects. I assume they are an amateur group, if they're professionals then..not so good. All that said it's free. I've really been enjoying this story! Please put out more :D The acting and the production value are pretty good. Keep them coming! These are well produced and well enough written that even the most casual fa of the genre should enjoy them. There is cearly a lot of planning and effort put into the episodes but they are too infrequent. I know, what do you want for free? I'm not saying they need to be weekly or anything but if an author wants to enter into a relationship with the admiring public they need to produce at least fast enough that the listeners can remember the details of the last episode. So points for quality but points off for frequency. This is a great effort by a talented cast. I look forward to the episodes, even if they are not as frequent as one would like. Alive Inside is a well-executed and interesting addition to the zombie-pocalypse pantheon. It is not particularly intense of a story, but it is presented surprisingly well. Each episode raises the overall quality, and I just hope they can keep a regular production schedule of some kind. It's a quality production with solid writing and ejoyable acting. Easily worth a listen. I really like this show. Please make more. Also make more Doctor Who please. 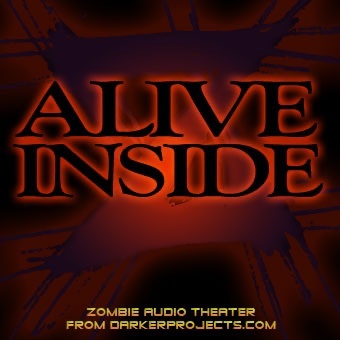 My favorite zombie apocalypse podcast! My only quibble is that the episodes are too far between, but I am always delighted to see the new ones show up! It's like xmas, easter, halloween goodies! I encourage you to listen and if you like, send feedback and maybe even make a donation to darker projects so they can work faster! The story is entertaining. And the acting features the usual melodramatic voice work that seems to be the trademark of Darker Projects. I found these months ago and listened to them back to back. It has now been too long now between posted episodes. I am tired of the wait and I am giving up on this podcast. It isn't good enough to warrant the long breaks in between. I found Alive Inside to be a very original, interesting story. I loved how they also added some humor into it. Mostly, it was surprisingly enjoyable for something that's free. The acting was terrible, I have to say, but what do you expect for a free podcast? It's definately worth your time if you are a zombie enthusiast like myself. The story is vary good. The production qualiety is not bad either. I have heard worse. Donald O. Copp has an awesome story. I was enjoying this audio-play, despite the hammy acting. About 8 minutes into part four the audio cuts out!! That's it! No ending! Thats's it folks! Skip this production until the bugs get fixed.